Does the Scientology religion have a concept of God? Most definitely. Scientology affirms the existence of a Supreme Being, although its dogma is unique and does not include the worship of one. Scientology believes that only through total spiritual enlightenment can one then truly discover and understand the Supreme Being. Why is Scientology a religion? Scientology meets all three criteria generally used by religious scholars when examining religions: (1) a belief in some Ultimate Reality, such as the Supreme Being or eternal truth that transcends the here and now of the secular world; (2) religious practices directed toward understanding, attaining or communicating with this Ultimate Reality; and (3) a community of believers who join together in pursuing the Ultimate Reality. Scientology beliefs in an Ultimate Reality that transcend the material world include its concepts of the thetan, the spiritual world (the seventh dynamic) and the Supreme Being (the eighth dynamic). Scientology holds in common with all great religions the dream of peace on Earth and salvation for man. What is new about Scientology is that it offers a precise path for bringing about spiritual improvement in the here and now and a way to accomplish it with absolute certainty. The second element can be found in Scientology life-rite ceremonies such as naming, marriage and funeral services, but predominantly in the religious services of auditing and training, through which Scientologists increase their spiritual awareness and attain an understanding of the spiritual world and, ultimately, their relationship with the Supreme Being. As to the third element, a very vital community of believers can be found at any church of Scientology at almost any time of the day. Scientology is thus a religion in the oldest sense of the word. Scientology helps man become more aware of God, more aware of his own spiritual nature and that of those around him. Scientology Scripture recognizes that there is an entire dynamic (urge or motivation in life) devoted to the Supreme Being (the eighth dynamic) and another dynamic that deals solely with ones urge toward existence as a spirit (the seventh dynamic). Acknowledgment of these aspects of life is a traditional characteristic of religions. What does the Scientology cross represent? 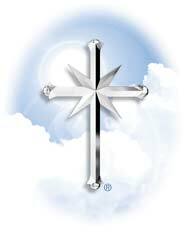 The Scientology cross is an eight-pointed cross which represents the eight parts or dynamics of life. The Scientology cross, which was first conceived in 1954, symbolizes the ability to live happily across all eight dynamics. As a matter of interest, the cross as a symbol predates Christianity. Do Scientologists have church ceremonies? Yes. Sunday Services are held regularly in Churches of Scientology. Scientology ministers also perform naming ceremonies for the newborn, weddings and funerals. Scientology is open to anyone who seeks spiritual betterment. The materials that make up Scientology scriptures are broadly published, widely promoted and available to anyone. Churches and missions are open to the public seven days a week. Anyone can come in for a tour and see personally what the Church is all about. Scientologists come from all walks of life, ranging from teachers to businessmen, doctors, housewives, attorneys, engineers, nurses, construction workers, celebrities, marketing and administrative personnel, secretaries, athletes, civil servants and virtually any other pursuit anyone can value. What does Scientology doctrine have to say about other religions? Scientology respects all religions. It shares with other religions the dreams of peace and salvation. Scientology ministers-in-training study all the major religions of the world to better understand how they fit into the larger religious community. Celebrity Centre International What Is Scientology?